Make sure and trim all loose ends. 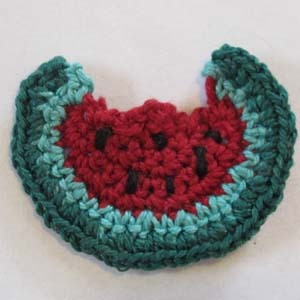 Then, using embroidery floss, stitch a few “seeds” into the red meat of your watermelon. This entry was posted on Thursday, April 19th, 2012 at 9:14 AM by Emilee Gettle	and is filed under Free Crochet Patterns. You can follow any responses to this entry through the RSS 2.0 feed. You can skip to the end and leave a response. Pinging is currently not allowed. This is such an adorable appliqué. Cannot wait to make one, myself, thanks for sharing it.